The Cowboys were awarded one fourth-round, two fifth-round and one sixth-round compensatory picks (137th, 171st, 173rd and 208th overall). The Cowboys traded their fifth-round selection (157th overall) to the New York Jets in exchange for the Jets' sixth-round selection in 2017 (191st overall). The Cowboys traded their fifth-round selection (173rd overall) to Oakland in exchange for Oakland's sixth-round selection (192nd overall) and fullback Jamize Olawale. The Cowboys traded their sixth-round selection (192nd overall) to the Los Angeles Rams in exchange for wide receiver Tavon Austin. The Cowboys' 2018 schedule was announced on April 19. CAR – Cam Newton 4-yard run (Graham Gano kick), 8:54. Panthers 7–0. Drive: 7 plays, 35 yards, 3:28. CAR – Graham Gano 27-yard field goal, 0:07. Panthers 10–0. Drive: 11 plays, 53 yards, 2:41. CAR – Alexander Armah 1-yard run (kick failed), 14:16. Panthers 16–0. Drive: 6 plays, 63 yards, 3:25. DAL – Ezekiel Elliott 4-yard run (Dak Prescott run), 8:58. Panthers 16–8. Drive: 10 plays, 75 yards, 5:21. Despite a strong showing from the defense, the Cowboys offense could only muster 8 points and fumbled late in the game, allowing the Panthers to run out the clock. This loss would start the Cowboys season at 0-1. DAL – Tavon Austin 64-yard pass from Dak Prescott (Brett Maher kick), 13:37. Cowboys 7–0. Drive: 3 plays, 75 yards, 1:34. DAL – Brett Maher 37-yard field goal, 6:06. Cowboys 10–0. Drive: 8 plays, 64 yards, 3:58. DAL – Brett Maher 29-yard field goal, 10:47. Cowboys 13–0. Drive: 6 plays, 16 yards, 2:39. NYG – Aldrick Rosas 28-yard field goal, 4:34. Cowboys 13–3. Drive: 11 plays, 66 yards, 6:12. DAL – Ezekiel Elliott 6-yard run (Brett Maher kick), 5:51. Cowboys 20–3. Drive: 14 plays, 82 yards, 8:23. NYG – Evan Engram 18-yard pass from Eli Manning (Aldrick Rosas kick), 1:32. Cowboys 20–10. Drive: 11 plays, 75 yards, 2:09. NYG – Aldrick Rosas 38-yard field goal, 0:15. Cowboys 20–13. Drive: 8 plays, 33 yards, 1:16. Dak Prescott threw his first touchdown pass of the year to Tavon Austin from 64 yards out on the 3rd play of the game. Ezekiel Elliott rushed for his second touchdown of the year. Brett Maher made his first two field goals as a Cowboy. The defense recorded 6 sacks and a fumble recovery. This win improved the Cowboys to 1-1. SEA – Jaron Brown 16-yard pass from Russell Wilson (Sebastian Janikowski kick), 9:28. Seahawks 7–0. Drive: 10 plays, 64 yards, 3:52. DAL – Brett Maher 50-yard field goal, 5:26. Seahawks 7–3. Drive: 8 plays, 48 yards, 4:02. SEA – Tyler Lockett 52-yard pass from Russell Wilson (Sebastian Janikowski kick), 1:52. Seahawks 14–3. Drive: 7 plays, 75 yards, 3:34. SEA – Sebastian Janikowski 47-yard field goal, 0:00. Seahawks 17–3. Drive: 6 plays, 29 yards, 0:49. DAL – Brett Maher 35-yard field goal, 3:43. Seahawks 17–6. Drive: 9 plays, 54 yards, 5:17. SEA – Chris Carson 5-yard run (Sebastian Janikowski kick), 12:54. Seahawks 24–6. Drive: 10 plays, 72 yards, 5:49. DAL – Tavon Austin 3-yard pass from Dak Prescott (Brett Maher kick), 7:11. Seahawks 24–13. Drive: 5 plays, 57 yards, 1:32. The Cowboys struggled mightily. Dak Prescott threw 2 interceptions and Ezekiel Elliott had a fumble late in the game. The only highlight was a Tavon Austin touchdown. This loss dropped the Cowboys to 1-2 on the season. DAL – Brett Maher 32-yard field goal, 4:34. Drive: 7 plays, 76 yards, 2:09. Cowboys 3–0. DET – Golden Tate 45-yard pass from Matthew Stafford (Matt Prater kick), 0:19. Drive: 9 plays, 77 yards, 4:11. Lions 7–3. DAL – Brett Maher 43-yard field goal, 11:06. Drive: 12 plays, 50 yards, 4:18. Lions 7–6. DET – Matt Prater 33-yard field goal, 2:54. Drive: 13 plays, 60 yards, 8:11. Lions 10–6. DAL – Ezekiel Elliott 38-yard pass from Dak Prescott (Brett Maher kick), 1:18. Drive: 4 plays, 75 yards, 1:11. Cowboys 13–10. DAL – Geoff Swaim 1-yard pass from Dak Prescott (Brett Maher kick), 3:01. Drive: 8 plays, 64 yards, 4:03. Cowboys 20–10. DET – Kerryon Johnson 8-yard run (Matt Prater kick), 14:20. Drive: 7 plays, 75 yards, 3:39. Cowboys 20–17. DAL – Brett Maher 22-yard field goal, 5:52. Drive: 16 plays, 85 yards, 8:31. Cowboys 23–17. DET – Golden Tate 38-yard pass from Matthew Stafford (Matt Prater kick), 2:17. Drive: 6 plays, 75 yards, 3:32. Lions 24–23. DAL – Brett Maher 38-yard field goal, 0:03. Drive: 9 plays, 55 yards, 2:17. Cowboys 26–24. The Cowboys bounced back from the previous week. Elliott totaled 240 yards and a touchdown. Prescott had 2 passing touchdowns. Geoff Swaim scored the first touchdown of his career. Maher went 4/4 on field goals, including a 38-yarder that won the game as time expired. This win improved the Cowboys to 2-2 on the season. DAL – Brett Maher 27-yard field goal, 10:06. Cowboys 3–0. Drive: 9 plays, 66 yards, 4:54. DAL – Brett Maher 43-yard field goal, 3:13. Cowboys 6–0. Drive: 5 plays, 37 yards, 2:35. HOU – Keke Coutee 1-yard pass from Deshaun Watson (Ka'imi Fairbairn kick), 13:40. Texans 7–6. Drive: 8 plays, 70 yards, 4:30. HOU – Ka'imi Fairbairn 20-yard field goal, 6:03. Texans 10–6. Drive: 12 plays, 79 yards, 5:54. DAL – Allen Hurns 3-yard pass from Dak Prescott (Brett Maher kick), 11:57. Cowboys 13–10. Drive: 5 plays, 16 yards, 1:59. HOU – Ka'imi Fairbairn 21-yard field goal, 5:05. Tied 13–13. Drive: 8 plays, 26 yards, 2:50. HOU – Ka'imi Fairbairn 19-yard field goal, 8:34. Texans 16–13. Drive: 9 plays, 59 yards, 4:55. DAL – Brett Maher 48-yard field goal, 5:43. Tied 16–16. Drive: 5 plays, 45 yards, 2:48. HOU – Ka'imi Fairbairn 36-yard field goal, 1:55. Texans 19–16. Drive: 8 plays, 72 yards, 3:38. The Cowboys controversially punted in overtime and allowed the Texans to take the ball down the field and win the game. This loss dropped the Cowboys to 2-3. DAL – Brett Maher 50-yard field goal, 8:40. Cowboys 3–0. Drive: 9 plays, 51 yards, 4:19. DAL – Dak Prescott 17-yard run (Brett Maher kick), 3:52. Cowboys 10–0. Drive: 7 plays, 48 yards, 3:26. DAL – Cole Beasley 17-yard pass from Dak Prescott (Brett Maher kick), 9:34. Cowboys 17–0. Drive: 9 plays, 84 yards, 4:49. DAL – Cole Beasley 9-yard pass from Dak Prescott (Brett Maher kick), 0:47. Cowboys 24–0. Drive: 16 plays, 78 yards, 7:14. JAX – Dede Westbrook 34-yard pass from Blake Bortles (Josh Lambo kick), 7:39. Cowboys 24–7. Drive: 8 plays, 82 yards, 3:27. DAL – Brett Maher 46-yard field goal, 3:09. Cowboys 27–7. Drive: 9 plays, 47 yards, 4:25. DAL – Brett Maher 32-yard field goal, 1:22. Cowboys 30–7. Drive: 4 plays, -6 yards, 1:31. DAL – Ezekiel Elliott 15-yard run (Brett Maher kick), 15:00. Cowboys 37–7. Drive: 2 plays, 31 yards, 1:16. DAL – Brett Maher 55-yard field goal, 7:12. Cowboys 40–7. Drive: 8 plays, 15 yards, 4:39. The Cowboys played lights out football. The defense got after Blake Bortles and only yielded 7 points. Cole Beasley put up 101 receiving yards and 2 touchdowns. Dak Prescott played stellar. The offense as a whole put up 40 points on one of the league's best defenses. This win improved the Cowboys to 3-3 on the season. WAS – Kapri Bibbs 23-yard pass from Alex Smith (Dustin Hopkins kick), 10:19. Redskins 7–0. Drive: 6 plays, 52 yards, 3:13. DAL – Michael Gallup 49-yard pass from Dak Prescott (Brett Maher kick), 1:00. Tied 7–7. Drive: 6 plays, 83 yards, 2:46. WAS – Dustin Hopkins 21-yard field goal, 9:10. Redskins 10–7. Drive: 10 plays, 72 yards, 5:50. WAS – Dustin Hopkins 25-yard field goal, 12:35. Redskins 13–7. Drive: 8 plays, 44 yards, 4:48. DAL – Brett Maher 47-yard field goal, 9:46. Redskins 13–10. Drive: 6 plays, 46 yards, 2:49. WAS – Preston Smith 1-yard fumble return (Dustin Hopkins kick), 4:55. Redskins 20–10. DAL – Dak Prescott 1-yard run (Brett Maher kick), 1:37. Redskins 20–17. Drive: 12 plays, 74 yards, 3:18. Brett Maher attempted to kick a 52-yard field goal in the dying seconds to tie the game, but it hit the left upright. This loss dropped them to 3-4. This was Amari Cooper's first game as a Cowboy as he was traded from the Oakland Raiders for a first-round pick, but the Titans pulled away late and won the game. This loss dropped them to 3-5 on the season. DAL – Brett Maher 25-yard field goal, 6:59. Cowboys 3–0. Drive: 9 plays, 31 yards, 3:46. DAL – Brett Maher 31-yard field goal, 3:41. Cowboys 6–0. Drive: 14 plays, 64 yards, 8:09. PHI – Jake Elliott 56-yard field goal, 1:33. Cowboys 6–3. Drive: 8 plays, 35 yards, 2:08. DAL – Dak Prescott 1-yard run (Brett Maher kick), 0:19. Cowboys 13–3. Drive: 8 plays, 75 yards, 1:14. PHI – Jake Elliott 26-yard field goal, 9:36. Cowboys 13–6. Drive: 8 plays, 47 yards, 3:21. PHI – Zach Ertz 15-yard pass from Carson Wentz (Jake Elliott kick), 2:08. Tied 13–13. Drive: 10 plays, 68 yards, 5:31. DAL – Ezekiel Elliott 7-yard pass from Dak Prescott (Brett Maher kick), 11:42. Cowboys 20–13. Drive: 9 plays, 75 yards, 5:26. PHI – Zach Ertz 1-yard pass from Carson Wentz (Jake Elliott kick), 7:27. Tied 20–20. Drive: 7 plays, 74 yards, 4:15. DAL – Ezekiel Elliott 1-yard run (Brett Maher kick), 3:19. Cowboys 27–20. Drive: 8 plays, 75 yards, 4:08. The Cowboys played an excellent game and stopped the Eagles late to seal the game. They improved to 4-5 with this win. DAL – Brett Maher 21-yard field goal, 3:00. Cowboys 3–0. Drive: 15 plays, 85 yards, 7:23. ATL – Matt Bryant 41-yard field goal, 14:56. Tied 3–3. Drive: 7 plays, 52 yards, 3:04. ATL – Matt Bryant 45-yard field goal, 0:34. Falcons 6–3. Drive: 10 plays, 33 yards, 4:13. DAL – Brett Maher 50-yard field goal, 10:20. Tied 6–6. Drive: 8 plays, 43 yards, 4:45. ATL – Matt Bryant 53-yard field goal, 7:16. Falcons 9–6. Drive: 7 plays, 47 yards, 3:03. DAL – Dak Prescott 4-yard run (kick failed), 14:23. Cowboys 12–9. Drive: 14 plays, 75 yards, 7:53. DAL – Ezekiel Elliott 23-yard run (Brett Maher kick), 12:33. 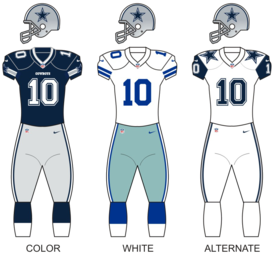 Cowboys 19–9. Drive: 2 plays, 31 yards, 0:41. ATL – Matt Bryant 21-yard field goal, 8:28. Cowboys 19–12. Drive: 9 plays, 72 yards, 4:00. ATL – Julio Jones 34-yard pass from Matt Ryan (Matt Bryant kick), 1:52. Tied 19–19. Drive: 6 plays, 68 yards, 2:10. DAL – Brett Maher 42-yard field goal, 0:00. Cowboys 22–19. Drive: 10 plays, 51 yards, 1:52. Maher kicked a game-winning field goal as time expired. The Cowboys improved to 5-5 with this win. Rookie linebacker Leighton Vander Esch put up a stellar performance with his 2nd interception in two weeks, which set up a crucial Ezekiel Elliott touchdown run. DAL – Ezekiel Elliott 16-yard rush (Brett Maher kick), 10:02. Cowboys 7–0. Drive: 10 plays, 75 yards, 4:58. WAS – Vernon Davis 53-yard pass from Colt McCoy (Dustin Hopkins kick), 7:04. Tied 7–7. Drive: 1 play, 53 yards, 0:08. DAL – Brett Maher 28-yard field goal, 1:28. Cowboys 10–7. Drive: 14 plays, 65 yards, 5:36. WAS – Trey Quinn 10-yard pass from Colt McCoy (kick failed), 9:02. Redskins 13–10. Drive: 3 plays, 25 yards, 1:29. DAL – Amari Cooper 40-yard pass from Dak Prescott (Brett Maher kick), 6:47. Cowboys 17–13. Drive: 6 plays, 75 yards, 2:15. DAL – Amari Cooper 90-yard pass from Dak Prescott (Brett Maher kick), 2:10. Cowboys 24–13. Drive: 2 plays, 91 yards, 0:55. DAL – Dak Prescott 5-yard rush (Brett Maher kick), 14:11. Cowboys 31–13. Drive: 5 plays, 17 yards, 2:20. WAS – Kapri Bibbs 1-yard rush (Dustin Hopkins kick), 11:43. Cowboys 31–20. Drive: 6 plays, 44 yards, 2:28. WAS – Dustin Hopkins 31-yard field goal, 1:13. Cowboys 31–23. Drive: 11 plays, 41 yards, 2:37. The Cowboys played an excellent game and got revenge on their division rivals. Dak Prescott connected with Amari Cooper for a 90-yard catch and run touchdown in the third quarter. With the win, the Cowboys moved to 6-5 and gained possession of first place in the NFC East. The Cowboys defense shut down Drew Brees and the Saints high powered offense, limiting their offense to a season low 10 points. Jourdan Lewis made the game-clinching interception with only 2:08 left to play in 4th quarter to seal the victory. This win improved the Cowboys to 7-5 on the season. DAL – Brett Maher 28-yard field goal, 2:25. Cowboys 3–0. Drive: 13 plays, 80 yards, 6:58. DAL – Brett Maher 62-yard field goal, 0:00. Cowboys 6–0. Drive: 7 plays, 18 yards, 0:52. DAL – Brett Maher 21-yard field goal, 8:59. Cowboys 9–0. Drive: 9 plays, 51 yards, 4:26. PHI – Alshon Jeffery 2-yard pass from Carson Wentz (kick failed), 6:04. Cowboys 9–6. Drive: 1 plays, 2 yards, 0:04. PHI – Jake Elliott 26-yard field goal, 12:11. Tied 9–9. Drive: 10 plays, 47 yards, 4:53. DAL – Amari Cooper 28-yard pass from Dak Prescott (Brett Maher kick), 7:46. Cowboys 16–9. Drive: 9 plays, 75 yards, 4:25. PHI – Dallas Goedert 3-yard pass from Carson Wentz (Jake Elliott kick), 3:12. Tied 16–16. Drive: 4 plays, 47 yards, 2:13. DAL – Amari Cooper 75-yard pass from Dak Prescott (Brett Maher kick), 3:01. Cowboys 23–16. Drive: 1 plays, 75 yards, 0:11. PHI – Darren Sproles 6-yard pass from Carson Wentz (Jake Elliott kick), 1:39. Tied 23–23. Drive: 6 plays, 75 yards, 1:22. DAL – Amari Cooper 15-yard pass from Dak Prescott, 1:55. Cowboys 29–23. Drive: 13 plays, 75 yards, 8:05. After a grueling back-and-forth match, the Cowboys won in overtime. This was their 1st overtime victory since the 2016 season, which was, coincidentally, also a 29-23 home win against the Eagles. Brett Maher made a successful 62-yard field goal attempt, which was a franchise record for Dallas and tied for the third longest in NFL history. Amari Cooper had his best game as a Cowboy thus far, catching 10 passes for 217 yards and 3 touchdowns. With the win, the Cowboys improved to 8–5, extended their lead in the NFC East to 2 games, and swept the Eagles for the first time since 2012. IND – Marlon Mack 1-yard rush (Adam Vinatieri kick), 6:09. Colts 7–0. Drive: 8 plays, 44 yards, 3:46. IND – Adam Vinatieri 43-yard field goal, 0:00. Colts 10–0. Drive: 11 plays, 59 yards, 1:53. IND – Marlon Mack 6-yard rush (Adam Vinatieri kick), 11:23. Colts 17–0. Drive: 8 plays, 75 yards, 3:37. IND – Adam Vinatieri 44-yard field goal, 1:36. Colts 20–0. Drive: 10 plays, 63 yards, 6:09. IND – Adam Vinatieri 23-yard field goal, 6:57. Colts 23–0. Drive: 12 plays, 55 yards, 7:59. The Cowboys were shut out for the first time since 2003. This loss dropped the Cowboys to 8-6 on the season. TB – Cairo Santos 37-yard field goal, 12:12. Buccaneers 3–0. Drive: 7 plays, 45 yards, 2:52. DAL – Dak Prescott 7-yard run (Brett Maher kick), 7:12. Cowboys 7–3. Drive: 8 plays, 75 yards, 5:01. DAL – Jaylon Smith 69-yard fumble return (Brett Maher kick), 1:57. Cowboys 14–3. TB – Cairo Santos 45-yard field goal, 9:19. Cowboys 14–6. Drive: 14 plays, 44 yards, 7:28. DAL – Brett Maher 59-yard field goal, 1:48. Cowboys 17–6. Drive: 4 plays, 5 yards, 0:26. TB – Jacquizz Rodgers 2-yard run (Cairo Santos kick), 0:25. Cowboys 17–13. Drive: 8 plays, 75 yards, 1:23. DAL – Brett Maher 20-yard field goal, 3:44. Cowboys 20–13. Drive: 12 plays, 56 yards, 6:59. DAL – Michael Gallup 4-yard pass from Dak Prescott (Brett Maher kick), 2:27. Cowboys 27–13. Drive: 2 plays, 4 yards, 0:09. TB – Mike Evans 7-yard pass from Jameis Winston (Cairo Santos kick), 2:12. Cowboys 27–20. Drive: 8 plays, 71 yards, 2:23. The Cowboys bounced back at home against the Buccaneers. Jaylon Smith made the highlight play of the game, recovering a fumble from Jameis Winston and returning it 69 yards for a touchdown. With this win, the Cowboys improved to 9-6 on the season and clinched the NFC East for the third time in 5 years. DAL – Blake Jarwin 13-yard pass from Dak Prescott (Brett Maher kick), 8:17. Cowboys 7–0. Drive: 13 plays, 65 yards, 6:37. DAL – Blake Jarwin 19-yard pass from Dak Prescott (Brett Maher kick), 1:55. Cowboys 14–0. Drive: 9 plays, 75 yards, 5:24. NYG – Cody Latimer 21-yard pass from Eli Manning (Aldrick Rosas kick), 0:22. Cowboys 14–7. Drive: 10 plays, 73 yards, 1:35. NYG – Aldrick Rosas 48-yard field goal, 9:05. Cowboys 14–10. Drive: 8 plays, 15 yards, 4:10. DAL – Blake Jarwin 39-yard pass from Dak Prescott (Brett Maher kick), 5:10. Cowboys 21–10. Drive: 8 plays, 76 yards, 4:00. NYG – Evan Engram 6-yard pass from Eli Manning (Eli Manning-Evan Engram pass), 2:00. Cowboys 21–18. Drive: 5 plays, 73 yards, 3:07. NYG – Wayne Gallman 2-yard run (Aldrick Rosas kick), 10:43. Giants 25–21. Drive: 8 plays, 81 yards, 4:14. DAL – Rod Smith 1-yard run (Brett Maher kick), 9:16. Cowboys 28–25. Drive: 5 plays, 75 yards, 1:27. NYG – Saquon Barkley 2-yard run (Aldrick Rosas kick), 3:27. Giants 32–28. Drive: 12 plays, 74 yards, 5:50. NYG – Aldrick Rosas 38-yard field goal, 2:39. Giants 35–28. Drive: 4 plays, -2 yards, 0:34. DAL – Cole Beasley 32-yard pass from Dak Prescott (Dak Prescott-Michael Gallup pass), 1:19. Cowboys 36–35. Drive: 9 plays, 70 yards, 1:23. The Cowboys earned a hard-fought win. The defense picked off a pass from Eli Manning while forcing a fumble for a turnover. Blake Jarwin had the best game of his career, accounting for 3 of the Cowboys' touchdowns. The Cowboys won the game after a game-winning touchdown pass from Dak Prescott to Cole Beasley along with the ensuing 2-point conversion from Prescott to Michael Gallup. With this win, the Cowboys finished 10-6. This marks the first time the Cowboys have recorded 3 consecutive winning seasons since they did so from 2007-2009. DAL – Brett Maher 39-yard field goal, 9:54. Cowboys 3–0. Drive: 10 plays, 54 yards, 5:10. SEA – Sebastian Janikowski 27-yard field goal, 7:05. Tied 3–3. Drive: 6 plays, 69 yards, 2:45. SEA – Sebastian Janikowski 42-yard field goal, 1:47. Seahawks 6–3. Drive: 6 plays, 28 yards, 1:29. DAL – Michael Gallup 11-yard pass from Dak Prescott (Brett Maher kick), 0:28. Cowboys 10–6. Drive: 7 plays, 75 yards, 1:19. SEA – Russell Wilson 4-yard run (Mike Davis run), 2:03. Seahawks 14–10. Drive: 9 plays, 44 yards, 5:01. DAL – Ezekiel Elliott 1-yard run (Brett Maher kick), 12:32. Cowboys 17–14. Drive: 9 plays, 67 yards, 4:31. DAL – Dak Prescott 1-yard run (Brett Maher kick), 2:14. Cowboys 24–14. Drive: 11 plays, 63 yards, 5:12. SEA – J. D. McKissic 7-yard pass from Russell Wilson (Chris Carson run), 1:22. Cowboys 24–22. Drive: 6 plays, 75 yards, 0:50. The Dallas Cowboys received the ball first after the Seattle Seahawks chose to defer during the coin toss. The resulting drive ended in a Brett Maher 39 yard field goal. The next three drives for both teams ended in punts. However, the Seahawks responded with a 27-yard Sebastian Janikowski field goal, thanks to 66 yards passing by Russell Wilson on the drive. After a missed 57 yard field goal by Maher, Seattle responded by a Janikowski 42 yard field goal. Dallas responded by a 75-yard drive which culminated in an 11-yard touchdown pass by Dak Prescott to Michael Gallup to lead 10-6. After both teams exchanged punts twice, Russell Wilson ran 4 yards into the end zone and converted a two-point conversion to lead the Cowboys 14-10. The Cowboys responded with an Ezekiel Elliott 1 yard touchdown run to retake the lead 17-14. After another Dallas touchdown drive, highlighted by a 16-yard Prescott scramble at 3rd-and-14 followed by Prescott scoring on a 1-yard run, Seattle responded with a touchdown and two-point conversion to narrow Dallas's lead to 24-22. The Cowboys sealed the game when Cole Beasley recovered an onside kick attempt of the Seahawks with only 1:17 left in the game. Ezekiel Elliott totaled a combined 169 yards both through the air and on the ground and also scored a touchdown. With this win, the Cowboys won their first playoff game since 2014 and advanced to the divisional round. This is also the first playoff victory of the Dak Prescott and Ezekiel Elliott era. The only sour note on a good Dallas win was a serious leg injury to WR Allen Hurns halfway through the first quarter, suffered after a reception when he was tackled by Seahawks safety Bradley McDougald. Hurns was carted off the field and taken straight to a hospital. After the game, GM Jerry Jones told the media that Hurns had broken his ankle and had a fracture in his leg. LA – Greg Zuerlein 25-yard field goal, 9:44. Rams 3–0. Drive: 11 plays, 68 yards, 5:16. LA – Greg Zuerlein 23-yard field goal, 13:40. Cowboys 7–6. Drive: 16 plays, 70 yards, 7:23. LA – C. J. Anderson 1-yard run (Greg Zuerlein kick), 7:00. Rams 13–7. Drive: 9 plays, 76 yards, 4:20. LA – Todd Gurley 35-yard run (Greg Zuerlein kick), 3:27. Rams 20–7. Drive: 6 plays, 64 yards, 2:38. LA – Greg Zuerlein 44-yard field goal, 10:03. Rams 23–7. Drive: 8 plays, 48 yards, 4:04. LA – C. J. Anderson 1-yard run (Greg Zuerlein kick), 7:16. Rams 30–15. Drive: 12 plays, 65 yards, 7:36. The Cowboys struggled mightily, but the defense couldn't contain the Rams' offense. Ezekiel Elliott was limited to just 47 rushing yards. With this loss, the Cowboys were eliminated from the playoffs. This also extended their streak of road playoff losses to 8 in a row. ^ "2018 NFL Draft Pick Transactions". ProSportsTransactions.com. ^ Walker, Patrik (April 19, 2018). "Dallas Cowboys 2018 regular season schedule revealed". 247Sports. Retrieved April 19, 2018.